Dennis O’Neil entered the whole wide world of comic books in 1966. Over the decades he has contributed to super-hero universes, as a writer or as an editor. One of his interests was Eastern Asian philosophies and martial arts. That was obvious in his distinctive overhaul of Wonder Woman, in a large chunk of his Batman work, and it was the whole point of his 1975-77 Richard Dragon, Kung Fu Fighter series. The three protagonists — Richard Dragon, Ben Turner and Lady Shiva — would become three of the greatest martial arts master in the DC Universe. This here profile specifically follows Benjamin Turner during his 1970s appearances. 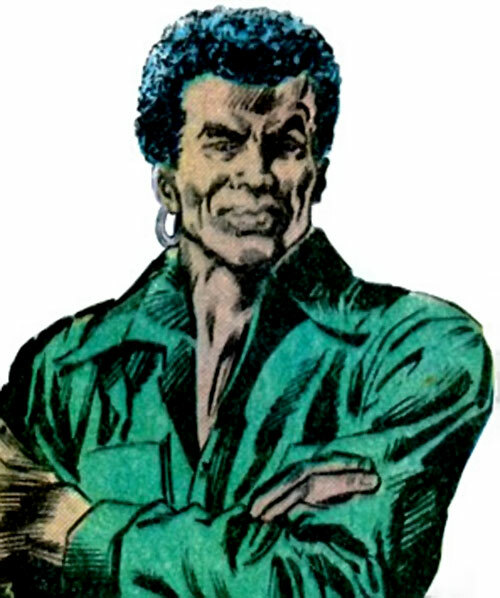 His better-known 1980s+ appearances are covered in the Bronze Tiger character profile. Known Relatives: Benjamin (nephew), Sister (name unrevealed, deceased). Group Affiliation: Occasional agent of GOOD, partner of Richard Dragon and Lady Shiva. Height: 5’11” Weight: 176 lbs. Turner is a master of the martial arts, quite able to defeat any opponent – or even groups of armed men. He is, however, not as skilled as the extraordinary Richard Dragon. It was presumably during the 1960s that Benjamin Turner came to Japan. There, he became one of the best pupils of the legendary O-Sensei, the greatest martial arts teacher in the world. Some years later Richard Dragon, then a bitter, violent, racist street punk, broke into the school to steal statues of the Buddha. Dragon insisted on a fight, but Turner easily vanquished him. As the years went by, Turner continued to study. Dragon demonstrated a meteoric rise in his mastery of the martial arts, and soon became the best student of the O-Sensei. But Turner was highly talented too – nearly as good as Dragon. By 1975, the O-Sensei came to consider that he had nothing left to teach the two men. Turner and Dragon went back into the world along with the O-Sensei’s goddaughter, Carolyn Woosan. Ms. Woosan was to study at a New York City university. Before they could leave the ryu, a man called Barney Ling, representing a mysterious organization called G.O.O.D., contacted them and offered them a mission. He wanted to take out a powerful slave trader in Eastern Africa. Eager at the thought of freeing brothers from slavery, Turner volunteered, followed by Dragon. The mission was a complete success, although Turner was dangerously nicked by a bullet near the end. Turner and Dragon decided to open a dojo in New York City, using an expansive property Dragon had inherited. As they recruited pupils, Turner fell in love with a young woman named Jane Lewis. However, while Turner was content teaching classes in various forms and dating Lewis, others around him had a greater, more violent destiny in which he would soon be caught in. After several violent attempts, during which Turner received another gunshot wound, Carolyn Woosan was accidentally killed by the international assassin called the Swiss. Following this, Dragon and Turner, along with their fierce ally Lady Shiva, started bouncing from one dangerous case to the next, often through the involvement of the enigmatic G.O.O.D. agency, ran by Barney Ling. Turned inherited a large acreage of prime logging estate somewhere in the northern USA. This lucrative property attracted more than its fair share of violence. The previous four owners had died under ill-investigated violent circumstances. The last of these had been Ben’s sister. Turner, Shiva and Dragon flew in and neutralized those responsible for the murders. It was a conspiracy of violent lumberjacks who weren’t inclined to share the revenue from the timberland. Turner also took in his nephew, also called Benjamin but soon nicknamed Junior. Ben Jr. had been living in the streets of the logging town since his mother had been murdered. The attempts at murdering Ben Turner did not stop, though. In fact, they escalated so far as to involve the dread League of the Assassins. These killers succeeded in hitting Turner with a poisoned dart. As the poison was unknown to western science, Dragon and Shiva had to investigate throughout the world to locate an antidote. They eventually found the captive O-Sensei, freed him and bought him to Ben’s bedside. The great teacher cured his former pupil. Those attempts against Turner’s life were not a product of random chance. It was a conspiracy by none other than Barney Ling ! The devious operator had been ordering those hits, reasoning that since the kung-fu disciples were relying on him for intelligence about who was after Ben Turner, he could keep sending them on missions in exchange for information. The recovered Ben and his paramour Jane were strongly considering marriage. Thus, Turner went to meet Lewis, her father. But Lewis, an officer in a highly secure US naval base, was also an agent of Professor Ojo. He deceived the kung fu disciples into investigating the supposed “ninja attacks” on the base so as to create a distraction. To make said assaults more credible the masked Lewis attacked his own home, along with a mercenary called the Axeman. During the fray, Jane was accidentally killed by the Axeman in front of Turner. Turner became manically motivated to murder Lewis. He and Dragon tracked the stolen nuclear submarine to the North Pole, where they assaulted Professor Ojo’s secret base. The formidable kung fu fighters scattered Ojo’s mercenaries and weird weapons, but Ben refused to leave with the others, trying to get Lewis. After he was left behind, the base exploded. Ben was presumed dead, leaving his best friend Dragon greatly distraught. Turner was not actually dead. Instead, he was captured by Professor Ojo, brainwashed and handed over to the League of Assassins. 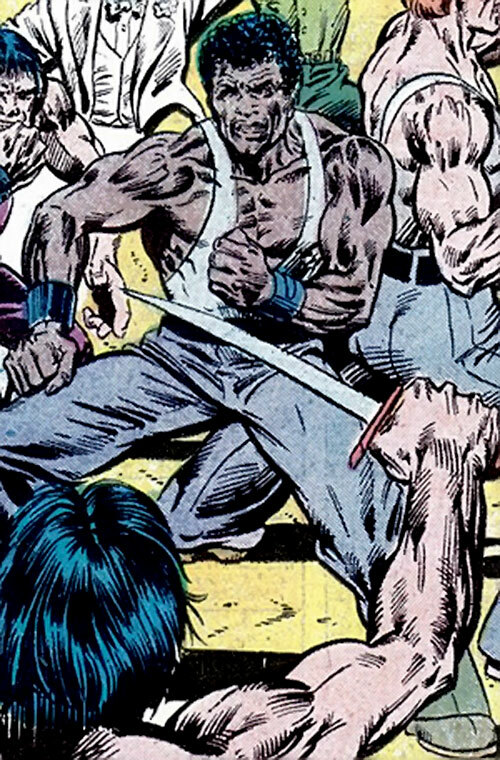 The altered Ben became one of the most feared martial artists and assassins in the world – the Bronze Tiger. Ben dresses as your typical 1970s cool cat, though not in an ostentatious way. 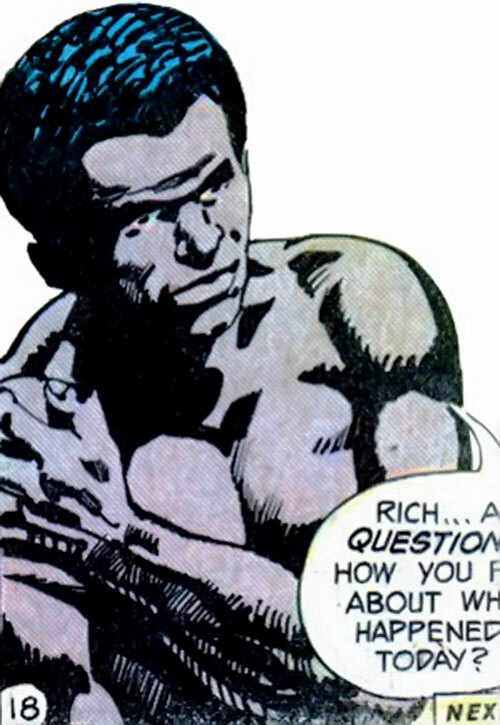 Of course, this being a US comic book, he has blue eyes. 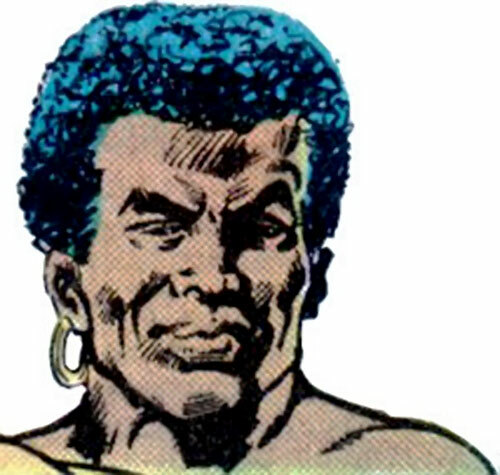 Your standard happy-go-lucky 1970s big city Black guy. Unlike Dragon and Shiva, Turner is not all intense and fierce. He’s more like a college student, mostly after good times, fun and romance. 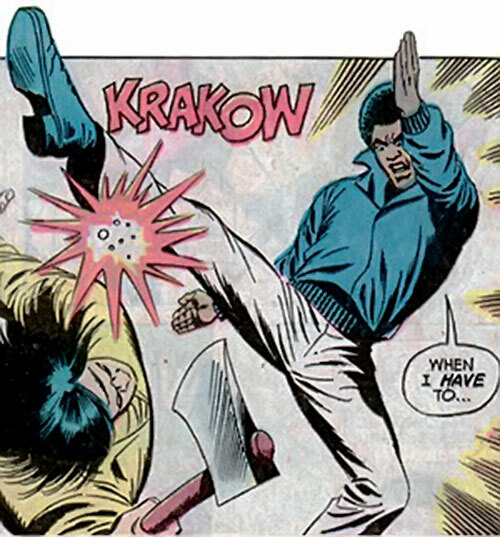 Obviously, he’ll more than pull his own weight in brawls, and is happy to demonstrate he’s a cool kung fu cat if needed. But he does not go out of his way to fight. Although he doesn’t enjoy fighting for the sake of it, Ben is young and proud. Therefore, he will resort to violence if provoked. This is especially true when he’s being subjected to racist comments, such as being called “boy”. He generally is quite impulsive, and is prone to strong passions. After Jane was killed, he was utterly consumed with his thirst for revenge. Turner is Black and proud of it. Therefore, he will usually care about brothers in trouble and try to help. He’s not political or tied to radical movements. Rather, Mr. Turner simply feels that Black folks get a bum deal and he should help with their problems. 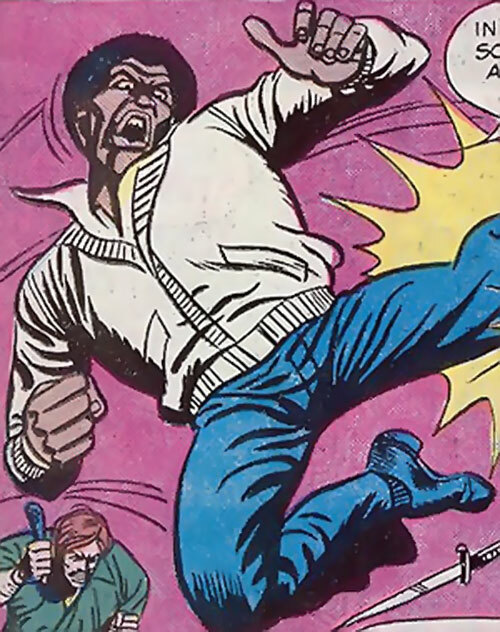 Being the Black guy in 1970s popular fiction, Ben will always be the one who gets wounded, or poisoned, or otherwise taken out so the spotlight can focus on the other characters. Iron Nerves, Language (Japanese), Lightning reflexes. G.O.O.D. (Low), Richard Dragon (High), Lady Shiva (Low). Dependents (Jane, Benjamin Junior), Unluck. As a Genre rule, guns are deadlier than usual in Richard Dragon : Kung Fu Fighter stories. Note that this set of Genre rules is actually pretty common in adventure comic books with such street-level, non-spandex clad protagonists. OV is automatically lowered by one CS against gunshots. RV is automatically lowered by one CS against gunshots (heroic gunshot victims will usually spend HPs to survive). Perception checks against Blindside attacks have a +1CS penalty on OV/RV. Blindside attacks are automatically conducted against an OV of 02. HPs cannot be spend against Blindside attacks unless survival is at stake. Note that mooks, being aware of those modifiers, will occasionally spend HPs on their attempt at stealth in order to deliver one of those very efficient Blindside attacks. 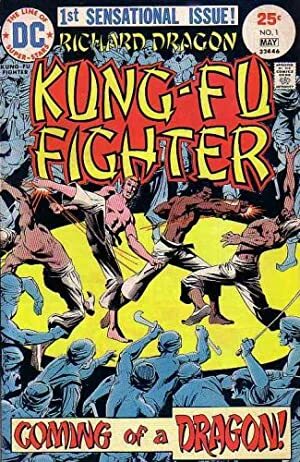 Source of Character: Richard Dragon Kung Fu fighter (as published around 1975).